The Battle of Eylau or Battle of Preussisch-Eylau, 7 and 8 February 1807, was a bloody and inconclusive battle between Napoléon's Grande Armée and the Imperial Russian Army under the command of Levin August, Count von Bennigsen near the town of Preußisch Eylau in East Prussia. Late in the battle, the Russians received a timely reinforcement from a Prussian division of von L'Estocq. The town is now called Bagrationovsk and is a part of Kaliningrad Oblast, Russia. The engagement was fought during the War of the Fourth Coalition, part of the Napoleonic Wars. Of all Napoleonic battles, this is considered to be the most uncertain and mysterious for several reasons — mainly the strength of Murat's reserve cavalry. Napoleon's armies previously smashed the army of the Austrian Empire in the Ulm Campaign and the combined Austrian and Russian armies at the Battle of Austerlitz on 2 December 1805. Austerlitz forced the Austrians to sue for peace and their Russian allies to withdraw from the conflict. On 14 October 1806, Napoleon crushed the armies of the Kingdom of Prussia at the Battle of Jena-Auerstedt. After a rapid pursuit, the broken pieces of the Prussian army were destroyed at the Battles of Prenzlau and Lübeck and in a series of capitulations at Erfurt, Pasewalk, Stettin, Magdeburg, and Hamelin. Eylau was the first serious check to the Grande Armée and the myth of Napoleon's invincibility was badly shaken. However, the French would end up defeating the Russians later in the year at the Battle of Friedland. In late January, Bennigsen's Russian army went on the offensive in East Prussia, pushing far to the west. Napoleon reacted by mounting a counteroffensive to the north, hoping to prevent their retreat to the east. After his cossacks captured a copy of Napoleon's orders, Bennigsen rapidly withdrew to the northeast to avoid being cut off. The French pursued for several days and found the Russians drawn up for battle at Eylau. In a vicious evening clash, the French captured the village with heavy losses on both sides. The following day brought even more serious fighting. Early in the battle, a frontal attack by Napoleon failed with catastrophic losses. To retrieve the situation, the emperor launched a massed cavalry charge against the Russians. This bought enough time for the French right wing to throw its weight into the contest. Soon, the Russian left wing was bent back at an acute angle and Bennigsen's army was in danger of collapse. A Prussian corps belatedly arrived and saved the day by pushing back the French right wing. As darkness fell, a French corps tardily appeared on the French left flank. That night Bennigsen decided to retreat, leaving Napoleon in possession of a snowy battlefield covered with thousands of corpses and many more wounded. With the Prussian army routed at Jena-Auerstedt, Napoléon occupied the major cities of Germany and marched on east in pursuit of the remaining forces opposed to him. These were largely Russians under the command of the frail 68-year-old Field Marshal Count Mikhail Kamensky. The old marshal was unwilling to risk battle, and continued to retreat, leaving the Grande Armée free to enter Poland almost unopposed. Nevertheless, as the French pressed aggressively eastward across the Vistula, they found the Russians defending the line of the Wkra River. 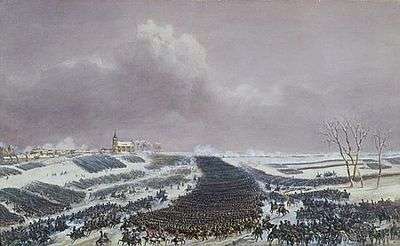 The French seized a crossing over the Wkra on 23 December at the Battle of Czarnowo. Russian resistance soon stiffened and on 26 December the two armies clashed at the Battles of Pułtusk and Gołymin. After these fierce engagements Napoléon's troops took up winter quarters in Poland to recuperate after a victorious but exhausting campaign. In January 1807, the new Russian army commander Levin August, Count von Bennigsen attempted to surprise the French left wing by shifting the bulk of his army north from Nowogród to East Prussia. Incorporating a Prussian corps on his right flank, he first bumped into elements of the VI Corps of Marshal Michel Ney, who had disobeyed his emperor's orders and advanced far north of his assigned winter cantonments. Having cleared Ney's troops out of the way, the Russians rolled down on the isolated French I Corps under Marshal Jean-Baptiste Bernadotte. Tough fighting at the Battle of Mohrungen allowed Bernadotte's corps to escape serious damage and pull back to the southwest. With his customary inventiveness, Napoléon saw an opportunity to turn the situation to his own advantage. He instructed Bernadotte to withdraw before Bennigsen's forces, and ordered the balance of the Grande Armée to strike northward. This maneuver might envelop the Russian army's left flank and cut off its retreat to the east. By a stroke of luck, a band of Cossacks captured a messenger carrying Napoleon's plans to Bernadotte and quickly forwarded the information to General Pyotr Bagration. At once Bernadotte was left unawares and a forewarned Bennigsen immediately ordered a retreat east to Jonkowo to avoid the trap. As Bennigsen hurriedly assembled his army at Jonkowo, elements of Marshal Nicolas Soult's IV Corps reached a position on his left rear on 3 February. That day, General of Division Jean François Leval clashed with Lieutenant General Nikolay Kamensky's 14th Division at Bergfried (Berkweda) on the Alle (Łyna) River, which flows roughly northward in the area. The French reported 306 casualties while claiming to inflict 1,100 on their adversaries. After seizing Allenstein (Olsztyn), Soult moved north on the east bank of the Alle. Meanwhile, Napoleon threatened Bennigsen from the south with Marshal Pierre Augereau's VII Corps and Ney's troops. 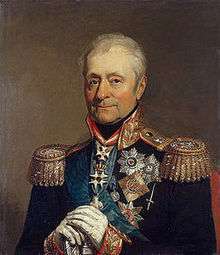 Kamensky held the west bank with four Russian battalions and three Prussian artillery batteries. After an initial attack on Bergfried was driven back, the French captured the village and bridge. A Russian counterattack briefly recaptured the bridge. That night, the French remained in possession of the field and Soult claimed that he found 800 Russian dead on the field. Marching at night, Bennigsen retreated directly north to Wolfsdorf (Wilczowo) on the 4th. The next day he fell back to the northeast, reaching Burgerswalde on the road to Landsberg (Górowo Iławeckie). By early February the Russian army was in full retreat relentlessly pursued by the French. After several aborted attempts to stand and fight Bennigsen resolved to retreat to the town of Preussisch-Eylau and there make a stand. 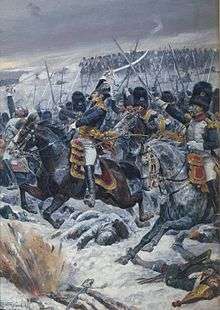 During the pursuit, perhaps influenced by the dreadful state of the Polish roads, the savage winter weather and the relative ease with which his forces had dealt with Prussia, Napoléon had allowed the Grande Armée to become more spread out than was his custom. In contrast, Bennigsen's forces were already concentrated. Marshal Soult's IV Corps and Marshal Murat's cavalry were the first French formations to reach the plateau before Eylau at about 14:00 on the 7th. The Russian rearguard under Prince Bagration occupied positions on the plateau about a mile in front of Eylau. The French promptly assaulted these positions and were repulsed. 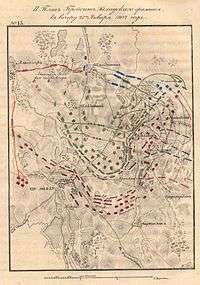 Bagration's orders were to offer stiff resistance in order to gain time for Bennigsen's heavy artillery to pass through Eylau and to join the Russian Army in its position beyond Eylau. During the afternoon the French were reinforced by Marshal Augereau's corps and the Imperial Guard, making up about 45,000 soldiers in all. Under pressure of greatly superior forces Bagration conducted an orderly retreat to join the main army. The retreat was covered by another rearguard detachment in Eylau led by Barclay de Tolly. The rearguard action continued when French forces advanced to assault Barclay's forces in the town of Eylau. Historians differ on the reasons. Napoléon later claimed that this was on his orders; that the advance had the dual aims of pinning the Russian force to prevent them retreating yet again, and providing his soldiers with at least some shelter against the terrible cold. Other surviving evidence however, strongly suggests that the advance was unplanned and occurred as the result of an undisciplined skirmish which Marshals Soult and Murat should have acted to quell but did not. Whether or not Napoléon and his generals had in advance the consideration of securing the town in order to provide the soldiers with a shelter for the freezing night, the soldiers may have taken action on their own initiative to secure such a shelter. According to Captain Marbot the Emperor told Marshal Augereau that he disliked night fighting, that he wanted to wait until the morning so that he could count on Davout's Corps to come up on the right wing and Ney's on the left, and that the high ground before Eylau was a good, easily defensible position on which to wait for reinforcements. 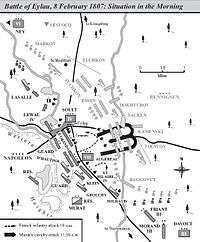 Whatever the cause of the fight for the town, it rapidly escalated into a large and bitterly fought engagement, continuing well after night had fallen and resulting in about 4,000 casualties to each side, including Barclay, who was shot in the arm and forced to leave the battlefield. Among other officers the French brigadier general Pierre-Charles Lochet was shot and killed. At 22:00 Bennigsen ordered the Russians to retreat a short distance, leaving the town to the French. Bennigsen later claimed he abandoned the town to lure the French into attacking his centre the next day. Despite their possession of the town most of the French spent the night in the open, as did all of the Russians. Both sides did without food — the Russians because of their habitual disorganization, the French because of problems with the roads, the weather, and the crush of troops hurrying towards the battle. During the night Bennigsen withdrew some of his troops from the front line to strengthen his reserve. This action resulted in the shortening of his right wing. Bennigsen had 67,000 Russian troops with 400 guns already assembled while the French had only 49,000 troops and 300 guns. The Russians could expect to be reinforced by Anton Wilhelm von L'Estocq's detachment of 9,000 Prussians; the French by Marshal Davout's depleted III Corps — proud victors of Auerstedt but now only 15,000 strong — and Marshal Ney's 14,000-strong VI Corps (making a total of 74,000 men), which was shadowing the Prussians. Bernadotte's I Corps was too far distant to take part. Dawn brought light but little warmth and no great improvement in visibility: the heavy snowstorms continued throughout the day. The opposing forces occupied two parallel ridges. The French were active early on probing the Russian position, particularly on the Russian right wing. Bennigsen, fearing that the French would discover that he had shortened his right, opened the battle by ordering his artillery to fire on the French. The French replied and the ensuing artillery duel lasted for some time with the French having the best of it because of their more dispersed locations. The start of the artillery duel galvanized Napoleon. Until then he had expected the Russians to continue their retreat. Now he knew he had a fight on his hands. Messengers hurredly were dispatched to Ney ordering him to march on Eylau and join the French left wing. Meanwhile, the French had occupied in force some fullering mill buildings within musket shot of the Russian right wing. Russian jagers ejected the French. Both sides escalated the fight, with the Russians assaulting the French left wing on Windmill Knoll to the left of Eylau. 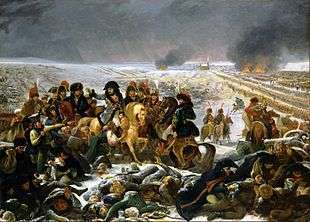 Napoleon interpreted the Russian efforts on his left as a prelude to an attack on Eylau from that quarter. By this time Davout's III Corps began to arrive on the Russian left wing. To forestall the perceived Russian attack on Eylau and to pin the Russian army, so that Davout's flank attack would be more successful, Napoleon launched an attack against the Russian centre and left with Augereau's VII Corps on the left and Saint-Hilaire's Division of Soult's IV Corps on the right. Augereau was very ill, having to be helped onto his horse. Fate intervened to turn the attack into a disaster. As soon as the French marched off a blizzard descended, causing all direction to be lost. Augereau's Corps followed the slope of the land and veered off to the left away from Saint-Hilaire. Augereau's advance struck the Russian line at the junction of its right and centre, coming under the fire of the blinded French artillery, and then the point-blank fire of the massive 70-gun Russian centre battery. Meanwhile, Saint-Hilaire's division, advancing alone in the proper direction, was unable to have much effect against the Russian left. Augereau's corps was thrown into great confusion with heavy losses, gives Augereau's official of 929 killed and 4,271 wounded. One regiment, the 14th Ligne was unable to retreat and fought to the last man refusing to surrender, its eagle carried off by Marbot. Its position would be marked by a square of corpses. Bennigsen took full advantage; falling on Saint-Hilaire's division with more cavalry, and bringing up his reserve infantry to attack the devastated French centre. Augereau and the three or four thousand survivors fell back on Eylau, where they were attacked by about 5,000 Russian infantry. At one point Napoléon himself, using the church tower as a command post, was nearly captured but members of his personal staff held the Russians off for just long enough to allow some battalions of the Guard to come up. Counter attacked by the Guard's bayonet charge and Bruyère's cavalry in their rear, the attacking Russian column was nearly destroyed. For four hours the French centre was in great disorder, virtually defenseless and in imminent danger. With his centre almost broken, Napoléon resorted to ordering a massive charge by Murat's 11,000-strong cavalry reserve — aside from the Guard, the last major unbloodied body of troops remaining to the French. Thus began one of the greatest cavalry charges in history. Somewhat obscured by the weather, Murat's squadrons charged through the Russian infantry around Eylau and then divided into two groups. The group on the right, Grouchy's dragoons, charged into the flank of the Russian cavalry attacking St Hilaire's division and scattered them completely. Now led by Murat himself the dragoons wheeled left against the Russian cavalry in the centre and, joined by d'Hautpoult's cuirassier division drove the Russian cavalry back on their infantry. Fresh Russian cavalry forced Murat and the dragoons to retire, but d'Hautpoult's cuirassiers broke through everything and the broken Russian were cut to pieces by fresh regiments of cuirassiers. D'Hautpoult then rode through the Russian guns chasing off or sabering the gunners and burst through the first line of Russian infantry trampling a battalion of infantry that attempted to stand. The cuirassiers forced their way through the second line of Russians and only after 2,500 yards did the charge finally expend its force in front of the Russian reserves. A second wave of cavalry consisting of the Guards and Grouchy's dragoons now charged the Russians as they attempted to reform and also rode through both lines of infantry. Another group charged into the Russian infantry in the area where Augereau's corps had made its stand. Not content with these heavy blows, the cavalry reformed, wheeled, and charged back again, finally retiring under the protection of the Guard cavalry. 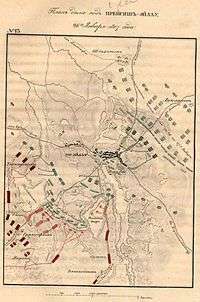 Murat had lost 1,000 to 1,500 well-trained troopers, but relieved the pressure on Augereau, Saint-Hilaire, and Soult paralyzing the Russians long enough to allow Davout to deploy in strength. Rarely had French cavalry played such a pivotal part in a battle. In part this was because, for the first time, Murat's men were now mounted on the best cavalry horses in Europe, freshly requisitioned in the aftermath of the conquest of Prussia. Davout's corps, about 15,000 strong, was now in position and began to drive in the Russian left. Despite the disarray of the Russian centre, Napoléon declined to follow up Murat's charge by advancing with the Guard. Such a move might have decisively won the battle, but Napoléon, well aware that 9,000 Prussians under L'Estocq and his chief of staff Gerhard von Scharnhorst were still unaccounted for, judged it wise to retain the Guard in reserve. Through the afternoon, Soult, Augereau, and Murat managed to hold their ground while Davout, assisted by Saint-Hilaire, gradually bent the Russian left back further and further pushing it back to a right angle with the Russian centre. By 15:30 it seemed that the Russian cohesion would soon break as their left was in full retreat. For several crucial hours Bennigsen could not be found, he having personally ridden to L'Estocq to urge that general to hasten the march of his Prussian corps to the battlefield. Bennigsen's mission was crowned with success. L'Estocq's 9,000 man Prussian force, having lost a third of its strength to Ney's pursuit, approached the battlefield via the Russian right and passed completely behind the Russian position to its left wing, gathering strength in doing so by collecting Russian stragglers and adding them to the 6,000 Prussian troops. At 16:00 L'Estocq counterattacked by falling on Davout's exposed right flank, and the heartened Russians soon launched a fresh attack against Davout. Over the next three hours Davout was halted and forced back to a line running from the village of Kutschitten to near the village of Anklappen towards Saint Hillaire's right by Eylau. Davout alert to the danger, formed a battery of his guns on the heights of Klein Sausgarten and personally rallied his troops while his guns drove the Prussians back into the woods. With nightfall, exhaustion set in and fighting on the Russian left petered out. By then the roar of cannons on the Russian right announced Ney's arrival. Napoleon had not recalled Ney until 08:00 on the morning of the 8th when he realized that the Russians intended to fight. Although within marching distance of the battle, the heavy snow had muffled the sound of cannon fire and Ney was completely unaware of events until a messenger reached him around 10:30. Somewhat delayed by L'Estocq's rearguard, the leading division of Ney's corps did not reach the battlefield until around 19:00 and immediately swept forward into the Russian right and rear. Bennigsen counterattacked. Bitter fighting continued until 22:00, at which point both sides drew off a little. After a contentious council of war with several of his generals forcefully arguing for continuing the fight for a third day, at 23:00 Bennigsen decided to withdraw and, covered by the Cossacks, the Russians silently began to leave. The exhausted French did not even notice until 03:00 and were in no condition to pursue. After 14 hours of continuous battle, there was still no result but enormous loss of life. Authorities differ greatly, estimates of Russian casualties range from about 15,000 to 20,000 killed or wounded and 3,000 soldiers, 23 cannon and 16 colors captured. Count von Bennigsen estimated his losses at up to 9,000 dead and 7,000 wounded. The French lost somewhere between 10,000-15,000 and 25,000-30,000 with 5 Eagles lost. David G. Chandler suggested as many as 25,000 French casualties, although conceding it is impossible to be certain. According to the estimates of the German historian Horst Schulz, the French lost 4,893 men killed, 23,598 wounded and 1,152 missed in action, which makes a total of 29,643. The French had gained possession of the battlefield — nothing but a vast expanse of bloodstained snow and frozen corpses — but they had suffered enormous losses and failed to destroy the Russian army. It was left to Marshal Ney to sum up. Riding over the fields of Eylau the following morning, Ney said, "Quel massacre! Et sans résultat" ("What a massacre! And without result"). Eylau was not at all the decisive victory characteristic of Napoleon's earlier campaigns, prolonging the war with Russia, until his decisive victory at the Battle of Friedland forced Tsar Alexander I to the peace table at Tilsit. In fact, after Eylau but before Friedland, Napoleon sent General Bertrand to the King and Queen of Prussia to see if a separate peace could be arranged which would see French forces completely withdraw from Prussia and her borders completely restored. Prussia, being allied with Russia, quickly rejected this offer which would have split the alliance. The Battle of Eylau forms the early part of the novel The Schirmer Inheritance (1953) by Eric Ambler. The brutal battle and its immediate aftermath are depicted from the point of view of an ordinary soldier, a Prussian cavalry sergeant, who is severely wounded by a French sabre in the later part of the confused fighting and whose only chance of saving his life is to desert and find shelter with Polish peasants in the neighborhood. ↑ This was administered by Poland as Iławką between 1945–1946. It is now in the Russian Kaliningrad Oblast, and was renamed Bagrationovsk in 1946, after the Russian General who commanded part of the Russian army. 1 2 Chandler 1966, p. 536. ↑ Chandler suggests that casualties may have been as high as 25,000 but concedes the actual number cannot be determined (Chandler 1966, p. 548); Franceschi & Weider 2007, p. 118 gives 14,000; Connelly 2005, p. 137 suggests probably over 15,000. Other sources suggest that their losses approached 25,000-30,000. See: Major Edward J. Murphy. A Tarnished Eagle: Napoleon's Winter Campaign In Poland, December 1806 Through February 1807. Pickle Partners Publishing, 2014, F. Loraine Petre. Napoleon's Campaign In Poland 1806-1807. Frontline Books, 2001. P. 205, Dwyer Ph. Citizen Emperor: Napoleon in Power 1799-1815. Bloomsbury Publishing, 2013. According to the estimates of the German historian Horst Schulz, the French lost 4,893 men killed, 23,598 wounded and 1,152 missed in action, which makes a total of 29,643. See: H. Schulz. Der Kreis Preußisch-Eylau. Geschichte und Dokumentation eines ostpreußischen Landkreises. Verden/Aller. 1983. S. 99. ↑ Asprey 2008, p. 58. ↑ Haythornthwaite 1996, Chapter 3. 1 2 Petre 1976, pp. 150–151. ↑ Smith 1998, p. 240. ↑ Petre 1976, p. 152. ↑ Petre 1976, p. 154–155. ↑ Petre 1976, p. 178. ↑ Petre 1976, p. 197. ↑ Petre 1976, p. 180. ↑ Petre 1976, p. 202. ↑ Petre 1976, p. 183. ↑ Petre 1976, p. 188. ↑ Petre 1976, p. 194. ↑ Franceschi & Weider 2007, p. 118. ↑ Connelly 2005, p. 137 suggests probably over 15,000. Franceschi & Weider 2007, p. gives 14,000. ↑ Chandler 1966, p. 548. ↑ Lloyd 1906, p. 287. ↑ Prendergast 1997, La Bataille d’Eylau.